Images, video, sound and signs tackle issues of wealth disparity, change, immigration, and race as inextricably interwoven with the concept of gentrification. The show also brings art out of the gallery space and into local business. 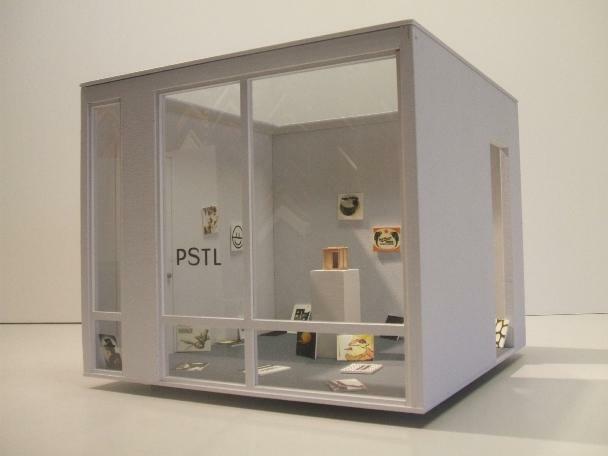 St. Louis Public Radio recently spoke with artists, business owners, and residents about the show. 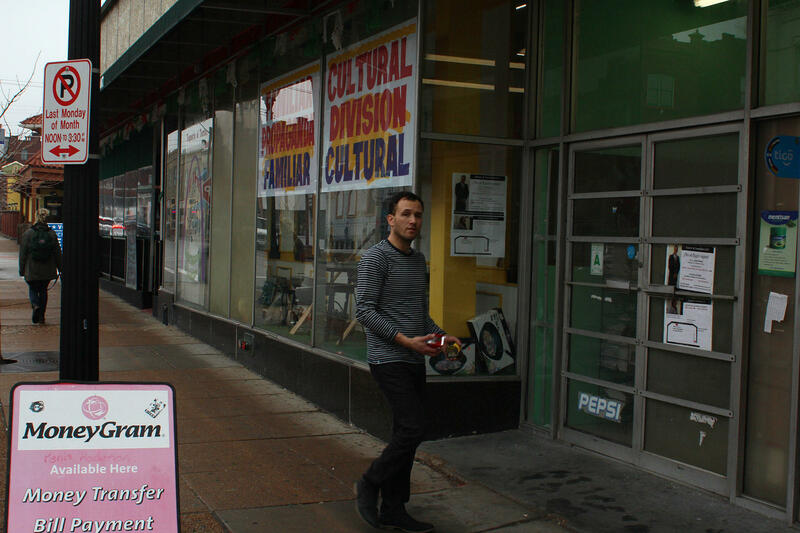 Alberto Aguilar has experienced one version of gentrification first hand. The Chicago born artist grew up in his parent’s small Mexican grocery store in a predominantly working class Italian and Lithuanian neighborhood of the city. 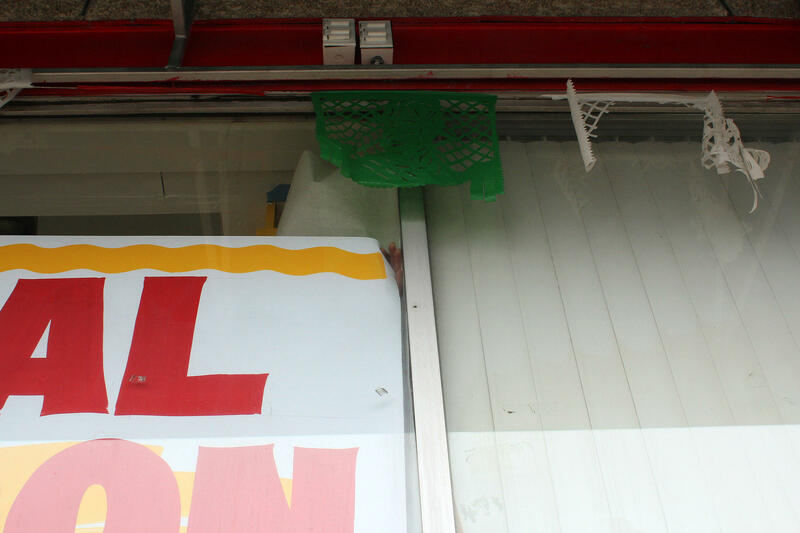 His parent’s grocery was eventually taken over by a larger chain, El Torito, and now the neighborhood where he grew is populated primarily by Latino families. Aguilar chose to use his personal history as the impetus for addressing gentrification on Cherokee. 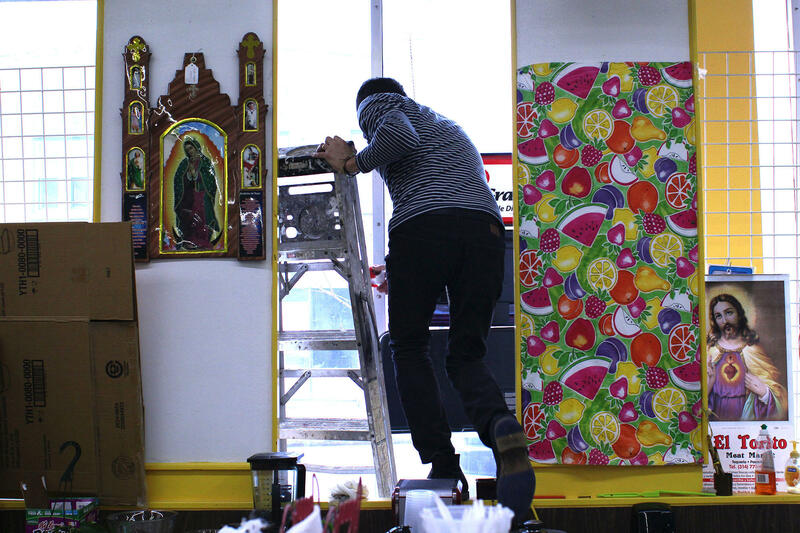 He created signs comprised of English/Spanish cognates, or words that look similar in both languages, in the classic style of hand-painted signs often associated with Mexican groceries in Chicago. The interplay between languages highlights a neighborhood drawn from multiple heritages. The phrasings have different connotations if read in English or Spanish. 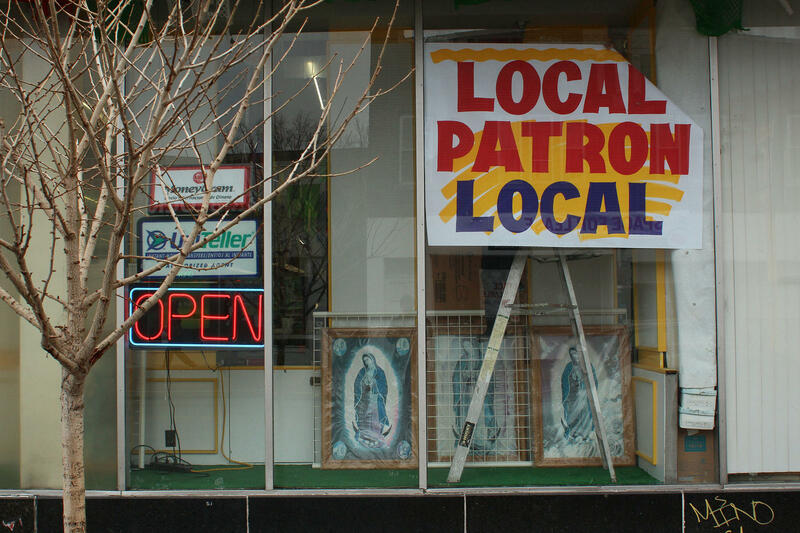 The phrase “Local Patron” in English points to neighborhood community-supported business, a concept currently in vogue. In Spanish “Patron Local” refers to “the main boss” or an authority figure according to Aguilar. The signs hang in Cherokee’s own El Torito, which has no connection to the Chicagoan El Torito. For the artist, using a medium like approachable signage is key to creating important, relatable, art. Luminary owners Brea and James McAnally have called Cherokee home for just over seven years. They’ve operated the Luminary for just two of those years in its new location. Before the move they ran The Luminary out of a space adjacent to Sweet Shears salon. They’re acutely aware of their status as young white artists in a historically Latino and African-American neighborhood and view deep community involvement as a necessary contribution to the area. “We certainly believe that both personally and organizationally that it’s our responsibility to address the issues that our neighborhood is facing,” said Brea. Those issues are represented through artists work. The sound of night sticks tapping represent police violence, a video documents a man eating prisoner’s last meals, and arrangements of domestic objects like chairs and magazines highlight different interior spaces for different community members. The organizers view these issues as interconnected with the disparity that rests at the heart of concerns regarding gentrification. Expanding definitions of “gentrification” and ensuring organizational fidelity to local perspectives outside their own experience were part of the show’s construction. “We’re training our own eyes to see the neighborhood as a whole, instead of just a part,” Brea said. 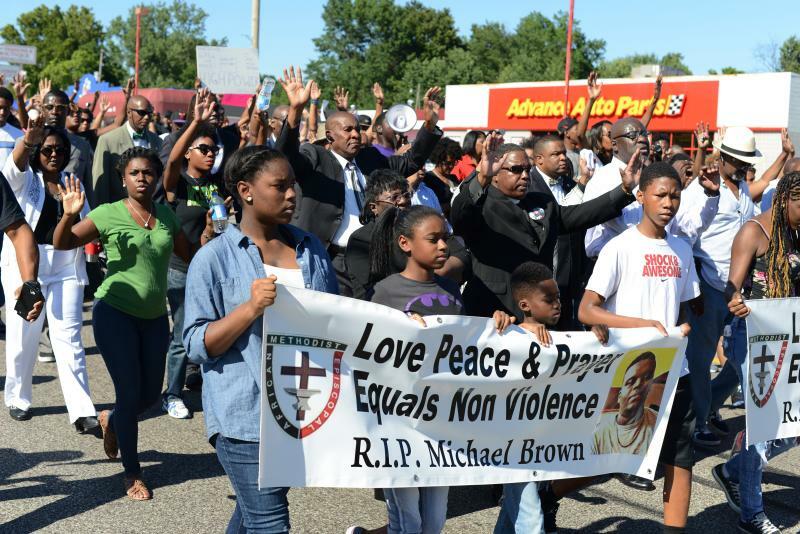 But an underlying question of spatial justice in the face of change remains for both organizers. “At first everyone’s excited to see new things happening and then the questions start coming: ‘If we’re making room for this, what are we pushing out to make room for this space,’” Brea said. Counterpublic is the product of three year old conversation between Brea, James and Angie Lee, who owns and operates Sweet Shears. Three years ago, Lee told Brea she’d love to display art in her salon if she had the space or time to do so. This jump-started Brea and James’ plans to involve local businesses in a show relevant to area concerns. Sweet Shears is currently struggling to stay afloat, and may be forced from its current location. Lee is having trouble meeting rent obligations a common hallmark of gentrifying neighborhoods. She says neighborhood-changing demographics of Cherokee mirror disparities throughout the city. “Other ethnic [groups] can walk around with a beer in their hand going bar hopping, but if a young black man with some trousers on and a sweatshirt - just because they’re in comfortable attire the rules are different,” she said. As part of Counterpublic, Lee shows portraits of influential African Americans by local art collaborative Work/Play in her front window. The work’s installation inspired Lee to play YouTube videos of Malcolm X speeches on the salon’s TV screen this past weekend. One of Lee’s customers, a man named Phillip, said he appreciated the art and the attempt to show work connected to his neighborhood. The Luminary Center for the Arts opened in 2007 and strives to provide a platform for the presentation of innovative art, music and cultural projects. Its temporary exhibition space now hosts Social Security, a constellation of five galleries individually curated by area alternative spaces which have shuttered or shifted in form within the past year. Among other things, the exhibition explores the how the arts community is evolving. Commentary: How Do We Cross The Fault Lines In Our Cities? Distance, whether measured in space or time, is often a friend to understanding. It clarifies where proximity distorts, allows us to grasp things in their entirety.